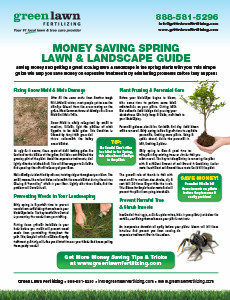 Spring is an important season for your lawn. It’s a memorable time when the kids go on their first Easter egg hunt. It’s the time when buds bloom, grass revives itself and trees and shrubs start putting out brand new leaves. We recommend you make the following preparations beforehand to ensure that your lawn has a successful and productive spring. Save and Compost Fall Leaves – Fall leaves added into compost at the start of winter will allow the leaves time to break down and become nutritious fertilizer for your spring lawn. In spring plants naturally have the energy they need stored up to grow again, but adding nutrients can ensure that they grow as effectively as possible. Avoid Pruning Shrubs in Autumn – You wouldn’t think that lawn care done in fall would affect your lawn by the time it got to be spring, but in the case of shrub pruning it definitely does. Many shrubs grow the buds that will bloom in spring before winter even begins, and pruning them away can keep your shrubs from showing off their stuff when the warm weather rolls around. Let Grass Grow Long – Allowing grass to grow longer than you normally would as autumn draws to a close will provide some protection against frost to the base of your grass blades, making it less likely that they will be broken by the time the grass thaws again. Map Out Your Veggies – While you are waiting for spring to arrive, mapping out where and what vegetables you want in your garden can save you time when the day comes to go out and plant. Try to plant plants that thrive in acidic soils and plants that prefer alkaline soils in separate groups so that they can be fertilized separately. Plant Cold Weather Crops – At the end of winter, you should plant any plants you like that bloom or produce food early in the year and can handle cold temperatures, such as peas, carrots and lemon or orange trees. Fight Slugs – Keep slugs and snails from wreaking havoc with your newly planted plants by mixing coffee grounds with your compost and adding it to the soil around your plants. Coffee grounds used in moderation add acidity to the soil that many plants enjoy, and that happen to drive slugs away. Use Fungicides – Applying anti-fungal treatments to grass before winter hits is an excellent way to prevent fungal winter diseases such as snow mold, which are especially likely to occur if heat and moisture become trapped underneath snow. You can also prevent fungal spring lawn diseases by carefully raking the lawn at the end of autumn. For the fungicide treatments and fertilizing treatments that can make your tri-state area lawn lively and colorful this spring, call Green Lawn today. A thick and luxurious lawn can be yours if you seed it correctly in the spring. 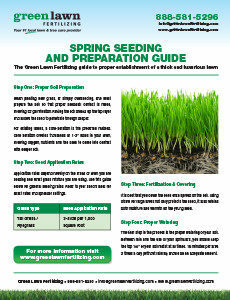 These guidelines for preparing and seeding the turf will help ensure your success. Learn how a little planning and investment in your lawn and landscape in the spring can help you cut costs for the rest of the year. $15 off each Fungicide application when you sign up for a 6-step Fungicide program. Green Lawn Fertilizing received an average service rating of 4.4 out of 5 stars from 1,152 ratings.